Well, 99% of the time I'm NOT going 'target shooting', or 'hunting big game', or 'defending the homestead'.....I'm just walking around the woods and fields and ponds and so on near my home. The 'purpose' - no big single purpose - just the idea that if I'm walking around on my own, or neighbors (with their consent) property, why in the world would I not have some sort of long-arm with me...? If in-season, I suppose I might take a shot at something for the dinner-table, but far more likely, I'll take a shot at a dirt clod, rock, tin can, or . . . nothing. But I just feel an adult should keep their firearms-skills up to date, and one could do that either by rigorous and disciplined (and expensive) time at a local shooting range, OR by far more enjoyable, relaxed, and inexpensive 'plinking' when out and about in a safe area for such activities. Plus, as a livestock owner, there are always feral animals to contend with that prey upon our chickens and goats, and one always seems to see them when NOT looking for them. So......what kind of firearm for 'woods-bumming'....? Leverguns are a natural - they carry easily (lightweight for a given chambering), are reasonably accurate, and just plain 'fun' to carry and shoot. Bolt-actions always seem to me to be guns one take when on a 'mission' - tailored for a specific range and power, and typically so accurate that one needn't worry about any 'miss' being the fault of the firearm. So if I'm ever called upon to snipe an enemy, or other similar task, I might consider the otherwise-bulky bolt-action. Pump-actions are fun, but not very many are out there (always wanted a Remington 7600 in 350 Rem Mag), and semiautos provide great firepower, but unless you like chasing brass, a 22 LR is the only semiauto I like for woods-bumming. Single-shots are great when wanting a 'nostalgic' experience (in which case a muzzleloader is even better), or when actually stalking and hunting game, but - it is really hard not to put leverguns at the top of the list when it comes to 'woods-bumming' rifles. OK then, what rifle, and what cartridge...????? The bottleneck ones are great, and I realize that the BLR and Savage 99 are sort of 'the best of both worlds' when it comes to the accuracy and trajectory of a bottleneck cartridge in a fast and handy levergun, but I just don't think of a 243 Rem or 7mm Rem Mag as casual 'woods-bumming' cartridges. Rimfire are great, and if I plan to massacre bunch of dirt clods, or actually squirrel-hunt, I'll take my Ruger 96/22, 22 WMR, or 96/17HMR, but odds are that if I'm just walking around I won't want to waste the WMR/HMR ammo, and a 22 LR just isn't enough 'oomph' to feel like I'm getting real practice with a hunting/defense round, or if I do indeed come upon a feral dog or game animal. (granted, as a kid, plenty of sheep-killing feral dogs were eliminated with the trusty 22 LR). So - long action, or short action...??? Long action guns I have to choose from over the years are 30-30, 35 Rem, 375 Win, 444 Marlin, 45-70, and 500 S&W. Short action guns I have to choose from over the years are 32-20, 357 Mag, 44 Mag, 45 Colt, and 454 Casull. I feel like the long-action guns are kind of like the bolt-actions - firearms I generally would take the time/bother to carry if I were actually on some sort of a 'mission' - any would do for whitetail hunting, and the smaller-bore ones with flatter trajectory would be my choices for a coyote or feral dog hunt, while the larger-bores would be my choices if I had a bear or elk hunt happening. But all of them are comparatively heavy and over-powered for 'woods-bumming' in the area where I live (no bears). The 454 Casull is more of a 'mission' cartridge, and would definitely be my choice if in bear-country, since the 454 Casull Rossi in 16" format is every bit as handy as any other Winchester 92 clone or Marlin 1894 in 44/45 caliber. Carrying it is mostly something I do just to keep it slicked up and maintain familiarity with it just in case I get lucky enough to go Out West again before I'm too senile to survive the trip. The 32-20, at the other end of the 'power' spectrum, is a PERFECT woods-walking gun, and although not quite my ideal for an impromptu whitetail shot, would suffice for everything else (with proper 'modern' loads), the brass is expensive and I just don't have tons of loaded rounds handy, so I only tote the 32-20 on occasion. Same (moreso) for the 218 Bee - it is a GREAT cartridge, but until I get a ton of brass I'll limit casual shooting and stick to 'load-development' and other more serious shooting. That leaves (for me, since I don't have any other hyphenated cartridges in short-action leverguns) 357 Mag, 44 Mag, and 45 Colt. ALL of them are great (and their hyphenated equivalents perhaps better in terms of smooth-cycling, in tradeoff for brass availability). But in ballistic terms, there is but little difference between a 0.430" 265 grain bullet and a 0.452" 265 grain bullet, and the difference in commonly available rifling twist (Ruger 96's are an exception) makes any theoretic ability to stabilize <200 grain or >300 grain bullets not all that big a deal for me. So it becomes mostly a "357 Mag versus 44/45 caliber" thing. Both are available in handy, 10-shot tubular magazine versions, and the Win92 and Marlin94 are both great firearms. The Marlins (and Henrys) are easier to put modern sights (aperture, scope, red-dot, holographic) on, but I've put all of those on Win92 clones (Rossi's) with minimal issues. However the larger-bore Marlins, and all the Henrys, are noticeably bulkier than the 357 Mag Marlins. If you look at the Marlins, their 1894's in 357 Mag are significantly handier than their 1894's in 44/45 chamberings. The Rossi's and the Winchesters they copy are pretty much the same heft/size in all chamberings. So - if I want to stick with the simplicity, or sight-versatility of a Marlin (or Henry), I will need to put up with extra bulk/length if I want the 'advantages' of a 44/45 caliber. If I stick with the Winchester 92 format, it doesn't matter. After 30 years of fiddling around with lots of leverguns, and liking ALL of them, I think when it comes to overall woods-bumming, I like the more compact design of the 16" barrel, and since I like the Marlin a bit better due to being able to easily mount a Williams FP and/or a Burris Fastfire-II holosight, the Marlin 1894 in 357 has gotten the nod for OVERALL 'woods-bumming' gun. I grab and tote that little stainless-steel gem more often than any other firearm when I go for a hike. Stoked with SWC 38 Specials, I won't ring my ears if I take a shot, and if I don't take a shot, I won't regret having toted the compact and lightweight carbine. If I run upon a feral or game animal it is plenty adequate for the task (and I keep some 180 gr SJFP's in the magazine too). Some days I tote the 44 Mag or other bigger-bore leverguns, but mostly I do that if I really plan to do a bit of deer-stalking. Some days I tote a Rossi instead, but since those are all the same size (unlike the Marlin 1894's) I often take the 45 Colt or even the 454 Casull 16" Rossi, since it can do things the 357 Mag Marlin can't. Anyway, those are my thoughts on 'woods-bumming' rifles. I have been fortunate enough to have many leverguns over the years to try and to compare. Many I've sold off, after realizing that they didn't do anything other guns couldn't do as well. Marlin 32-20 Win - classic as well, and also one I need to shoot more. Marlin 357 Mag - kind of the perfect mid-caliber levergun - very versatile. 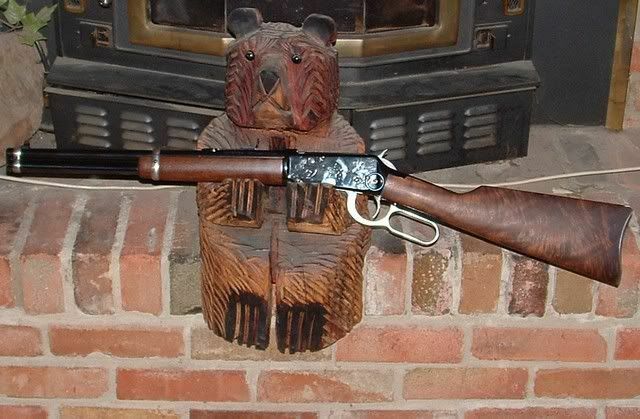 Marlin 44 Mag - my default deer-hunting gun - hard to sell because it always just works. Rossi 357 Mag - great and light weight, but not sure it does anything the Marlin can't. Rossi 454 Casull - the most powerful and compact levergun - at 16" it is light, but packs a punch. Rossi 45 Colt - classic, but not sure it fills any purpose the 454 isn't as good or better at. Marlin 1894cl 32-20 does what needs to be done. Any muzzleloading rifle under 6 pounds in weight. There are not many of those around. All around do everything woods gun... my first choice would be a Winchester 94 in thutty thutty. But given your options Marlin 1894 in 357. Squills to deer. And enough rounds for any two legged varmit’s you most likely won’t encounter but... I am a carry two pocket knives kinda guy. Winchester mdl 94, .30-30... Trapper. I stick with the bottleneck rifle cartridges though I agree with much of your reasoning for choosing otherwise. Out here in the desert it's sometimes a stretch to reach a coyote with a .30-30 trapper. My '92 is maybe a little handier but I still prefer the '94 in .30-30 to the .45 for range alone. If I had more time I'd like to fiddle with finding a good load for the .45 and seeing what I can do with it but as it is cheap Remington .30-30 ammo is easier. My favorite "carbine" is my 1895 in .30-40 but that is every bit as long and maybe a bit heavier than a standard cheapy bolt action of the same caliber with a decent scope on it. Just in the last year I decided on a 73 SRC in 44-40. It's been my favorite cartridge for over 50 years and I have several Colt SAAs in that caliber for companions. Usually I just pack a pistol when I go to my shop but often I pick up the 73 which sits in corner near my bed stand. I keep 10 in it and the lever lock on since the youngest is 9 and well schooled. When I got the urge to kill a deer this past season it's what I picked up and it didn't fail me. Kinda fun to make a kill with a gun built in 1895. I automatically thought of my Marlin 1894C .357. Put a few magnum loads in a pocket, load 'er up with some of my 900 FPS lead SWC in case I encountered a plinking target of opportunity. Yep, IMO the 1894 would be ideal for this. Doc...the rifle I sold you is the best. 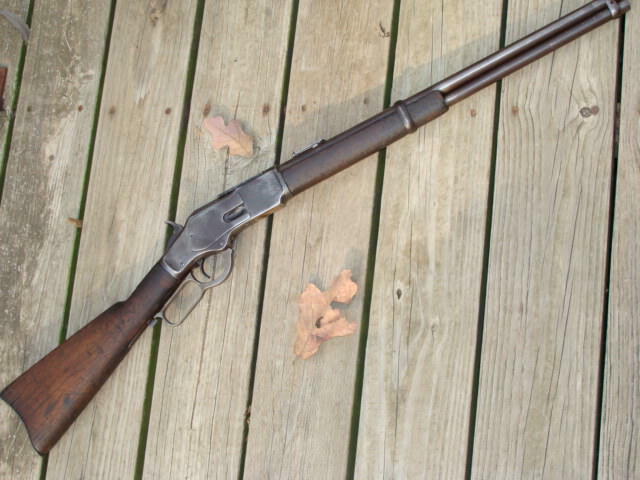 The Remington model 25 in 32-20 or 25-20. Anybody not residing in bear country or enemy territory is not a gun guy if they choose anything besides a .22 rifle or something similar for waltzing around in the woods. Tycer and I think alike...if your bumming, who in the hell wants a cartridge that makes a lot of noise? Who wants to carry a 7 pound rifle..... You want something that you can carry a lot of ammo and shoots at or below the speed of sound....less noise, no recoil for lots of shooting if ya feel like it. . Better than a .22 would be a light rifle in a center fire cartridge that has about the exact same size and profile of a Winchester model 61 and that is the Remington Model 25 .....light..sleek. ..centerfire ......... ..accurate... powerful enough for a deer if need be or light enough for a frog in the pond...or a clod of dirt.....or a rock. Winchester model 62...Remington model 25 in 25-20......Winchester model 61 .....Marlin 39..(notice how it's bigger) and the last on the right is soon-to-be Fordwannabe's Marlin 94 in 218 Bee...that Bee is noticeably heavier than any of the other guns. Most of my woods loafing is in winter on snowshoes. That dictates a few things, mostly length. I always carry a short centerfire rifle (sorry Six, no 22 for me). The only bolt that is passable for me is my Ruger GSR. I rarely use it however, usually going with my Winchester 94 Trapper in 44, 30-30, or 32WS. I also use my Rossi 92 in .357. On occasion, I use a short AR15 or an M1 carbine. I much prefer a sling in winter, also. I don't use a lot of my old originals in this role, but I have an old 92 SRC in 38-40 with no finish that's a great shooter. Been known to pack this one. If I carry a 22, it's a handgun in addition to a rifle. I like your reasoning Doc. With a rebuilt shoulder that pings most days I really like my 94 src 25-35... or my old model 1903 mannlicher schoenauer. I believe the .357 would be a great walking cartridge. Yes, versatile in many packages. But since I began rollin my own, the ol dirty-30 has kept me very happy. From 45 on up to 200ish grains of lead, slow and quiet or loud and just powerful enough. The only time I tried to blow up a squirrel with it, I bounced a fast 170gr pill off the top of his head. Took a neat little strip of fur off right between it's ears. Put him on a spit. Next up was a rock chuck. As I looked back on my trail I noticed a funny lookin stick that I didn't recognize in passing. As I brought my bino's up I realized that stick was lookin at me! Bino's slowly down, Winchester slowly up and when the smoke cleared it was gone. As I strolled up around 40 paces later I saw I hit em in the neck. Pretty messy, but he made a great and tender butter fry. Then I got to thinkin..... sometimes less is more. That was 20 some years ago, and after experiencing enough different calibers and rifles, I still (more than anything else) choose to walk with that same 94 30-30. Only now, I don't have to blast it if I don't need or want to. I bought it to use it, and I've found the ol peep sighted slab side to be of more use to me now than it ever was... as a very handy hunter, defender or plinker. Sadly here rifles are forbidden for the majority of hunting, (except for ground hogs, fox & coyote) so my vote goes to either my 28 ga Rizzini or my M1Super 90 Benelli. My vote would go towards a 25-20, 327 on the small end or one of my favorite rifles the Ruger 44 carbine. As of late I'm only bring up my Ruger Mini 30 and S&W model 48-4 22 Mag when I go up to camp. Of course, during hunting season my arsenal changes . Yeah Six, that Remington 25 in 32-20 is another really good choice, and I think that if I get more time to make some reloads up, I'll be totin' it more. A bit shorter barrel might be nice, but it is definitely light weight, and one just has to marvel at the engineering, design, and execution of that little rifle. I’ll have to go with one of my Marlin 27s or Rem 25 in either 25 or 32 WCF. Although my mod 53 Win in 25 WCF is a good one. No bears or enemy in my woods and no .22s. When checking fence or snare, cutting cedar, I carry a minimum 357 long gun. A chance meeting with hogs, cats (large or small), exotic deer or coyote needs more fpe. 22s are used to dispatch critters caught in traps. ....soon to be Fordwannabe’s marlin 1894 in 218 bee. Beautiful ain’t it. Ok back to the real post. IMO, the choice of which firearm to take along when woods-bumming depends upon where the "woods" are. Here in Southern New England, most centerfire rifle and all handguns are proscribed from use afield (gun ranges R OK). 6, No 22s for me any more. Neighbor's son-in-law was treed last fall by a huge black boar hog while bow hunting. We have cougars too since our deer population is so dense. There is even the occasional bear sighting so the 44 WCF is a comfort to me. LOL - I have a Marlin 94 in 32-20 and in 218 Bee. I've of course been thinking I must get a 25-20 as well, right....so I have the full set of 32-20 derivatives. No...no.....stay here.....YOU, my fine friend will soon have the bragging rights to the most accurate levergun known in the history of the world....that exact gun....,not one like it......I'm taking you under my wing to continue the tradition of being "Mr. Cool" after I pass over the great divide. This particular rifle has always been affectionally known as the "Cat Rifle". Now son, you take care and I'll see ya next Saturday and if you want to contInure to be my adopted son, stay OFF the octagon barreled 1899 Savage and the 1909 Colt in 45 L.C. at the auction. M.M.....my ignorance....I forgot about you western/southern/northern guys who have other critters capable of puttin' a hurt on ya. Here, in the east,you have to be wary of the 2 legged variety. Did y’all see the most important part of this whole post....soon to be Fordwannabe’s marlin 1894 in 218 bee. Beautiful ain’t it. Ok back to the real post. I'm just wonderin' how much he's paying you to take that carry-handle equipped levergun off his hands? Doc...I like your 2520. Can you shoot a John Deere with it? I know Griff I felt sorry for him having an atrocity like that, so I didn’t charge him full price. My Wildcat is a 570 and it's a double! Doc I'm thinking your 2520 ain't near as fast as my 570? Six's 3350 might be a tad faster that your 2520, it probably makes more FPE as well! Just finished milling down some black walnut. From. 1 1/4" to 1/2" . Filled close to 2 metal trash cans with chips. For years my favorite woods walking tool was a Reminton 552 with a pocket full of a mixed bag of ammo.The 552 was designed for easy SS loading so ammo could be as needed. My favorite squil load was a hs Short hp of any available brand. But that was back when you could pick up a box of 50 at the gas station for less than a buck. I evolved to the reality of LR all the time but craved variety. It came in the form of a Hornet over .410 Springfield M6. I routinely load Hornet ammo at everything from full throttle down to .22 Short standard velocity with the bullet seated backwards. Haven't tried any cast boolits because I haven't found any commercial cast. Everything from squils to feral cats, or the odd coyote. No hogs or dangerous critters in our neighborhood. Alternates are a scoped Contender carbine in Hornet or a Ruger American bolt gun also scoped in .22 WMR. Or my other largely varied load, .30 WCF in a 94. From 100 gr cast or 87/93 jacketed for the Mauser/Luger up to the classic 170 gr big game killer and everything in between. Since I almost always load SS even pointy bullets are useful. And of course a Ruger MKII on my belt. So many choices, need more woods walking. My 32-20s fit the bill for bumming around in the woods. 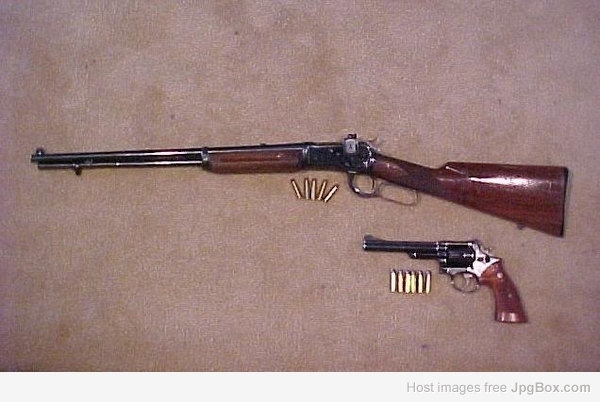 A Marlin and S&Ws, all from the early 1900s. Three at once may be overkill, though! Love the pics of the east (and from what I hear, sane) part of Washington; even in Indiananner, sometimes it is good to just hike, stop, set a spell, and look at stuff. Sometimes I take along a book by James Thom or something like that. Six I do just LOVE those little Marlin CL's, but the only practical reason I would add the 25-20 is so after I keel over my wife could have a whole set of the three 32-20 derivatives to sell to some high-roller collector instead of single odds-and-ends to have to figure out how to selI individually. Last edited by AJMD429 on Fri Jan 25, 2019 7:06 pm, edited 1 time in total. Doc in anticipation of a couple new arrivals I spent some time this past weekend wiring my old safe for a dehumidifier rod and more lights. I then took all the leverguns and wiped them down, hung tag with make, model, caliber, and DOM on each. That was a bit of an undertaking. Hugged each one and as I was hugging made a note of things they needed such as a Marlin bulls eye on this or a buggerEd screw on that and come to realize the dust cover on a 1873 is not working correctly. I know I am a neglectful person that guns are in the safe with these flaws. Please forgive. Oh and I use Remoil my adopted Dad told me to. The Blue Ridge Parkway....is wonderful.....I never tire of it. Me either. I live near Milepost 376. Not many places around here to walk in the woods. If I could find such a place, coyotes and wild pigs would be the largest critters likely to be encountered. A .22lr such as my Henry levergun would be enough in all but a very few cases. I could carry my GP100 on my hip if I really felt the need. Living in the city, there aren't many places to just go bumming in the woods. AJMD I settled on the one centrefire I own based on the same requirments you gave and also came up with the same calibre. aka a lever aka 357. When I hunted big game I saw bolt actions as the ultimate rifle, they got the power, accuracy, aftermarket options, ease of handloading and reliable feed usually cornered. But I found as a utility rifle a lever is easier to carry stow and draw so it got the nod. On a boat, backpack, horse, from behind the seat of a tractor or vehicle it slips out in a second. Some actions are faster in use but not many are faster to get into use. Great thread with some wonderful posts. Pitchy, that Cowboy carries like a dream, doesn't it? A guy can get a lot of work done with the Lee 340-grain cast boolit over a dozen or more grains of Unique. I had not thought of an M-1 Carbine, but that would be a fine choice in a lightweight -- and yet cougar capable, if not a best choice for bears.